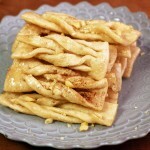 Maejakgwa is a Korean traditional cookie that’s really popular. The ingredients are very simple! The combination of 3 kinds of flavors make this cookie very special: ginger, cinnamon, and the pine nuts. The best part of this cookie is that it’s very crunchy! If all family members sit around together after dinner and taste these cookies, the sound of crunching from each member will give so much fun! You can make this large amount of cookies in 1 hour if you use your food processor, longer if you have to knead by hand. Flour, salt, sugar, ginger, pine nuts, water, cinnamon powder, and vegetable oil. In a large stainless bowl, place 2 cups of all purpose flour, ½ ts salt, 1 TBS sugar, 1 TBS ginger juice, and ½ cup water. Knead by hand for about 20 minutes. *tip: If you use a food processor, kneading takes about 2 minutes. Be sure to change the blades on your food processor to dough-making blades!. Put the cookie dough in a plastic bag and set it aside at least for 30 minutes. Chop 2 TBS of pine nuts to garnish the cookies. Set aside. Take the dough out from the plastic bag and roll it out with a rolling pin, into a roughly rectangular shape (about 50 cm x 40 cm, and 2 mm – or 1/16 inch – thick). Cut the sheet of cookie dough into little 2 cm x 6 cm rectangles. Put the leftover dough edges into a plastic bag to protect them from drying out. Make 3 slits in the middle of each piece of dough. Push one end of the dough through the center slit to a make ribbon shape. Take the leftover dough out and spread it on the cutting board with the rolling pin. Cut it into any of your favorite shapes: triangles, squares, whatever – or use a cookie cutter. Heat up vegetable oil in a wok or frying pan. *tip: Put a sample of the cookie dough into the heated oil to check if it’s the right temperature. The dough should float slowly on the surface of the heated oil. Place ½ cup sugar and ½ cup water into a pot and bring to a boil over low heat for about 20 minutes. About half of the water should evaporate, so the syrup is nice and thick. Turn the heat off and add 1 ts cinnamon powder and stir it well. Gently toss the cookies with the syrup to lightly coat them. Sprinkle the chopped pine nuts on top of the cookies. Posted on Thursday, December 17th, 2009 at 3:54 pm. Last updated on April 26, 2015. Posted December 31st, 2009 at 4:31 pm | Log in to reply. I made it today… it didn’t turn out perfectly though. The dough was really sticky (could I have kneaded for too long? I used a kitchenaid mixer), and I didn’t have the time to cut all of the ribbons, so I used a small circular cookie cutter. They got really puffy when I cooked them, but they were good nonetheless! Posted December 31st, 2009 at 5:19 pm | Log in to reply. Anyway next time you make it again, I’m sure you will be more satisfied with your cookies! If your dough is too sticky, add more flour. 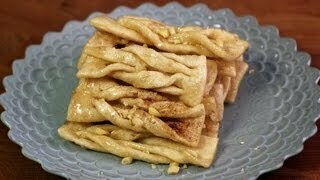 I have made maejakgwa twice since I made it for this video recipe. Yeah, I used cookie cutter once and it really saved time! When you use a cookie cutter, the sheet of dough should be very thin, Otherwise, it won’t be crispy enough when it’s fried. Happy New Year! I will post the photo on my website soon! Posted January 4th, 2010 at 9:38 am | Log in to reply. Posted December 30th, 2009 at 4:04 am | Log in to reply. I’ve seen pictures where they seem to have been colored; a different color on each side, so when braided, you can see both. Do you know how they are able to dye both sides of the dough? Posted December 30th, 2009 at 7:50 am | Log in to reply. It’s easy, but takes much more time! That’s it! The rest of process is the same as the recipe I posted. Posted December 21st, 2009 at 3:30 pm | Log in to reply. I just got done making these cookies. Mine did not turn out crunchy like you said. Maybe I need to roll the dough finer? However,I still liked the way they came out, but I had to add a little bit more water than you specified for the dough to come together and I only added 1/4 tsp of cinnamon in the syrup as 1tsp would have been too much. After mixing the syrup with the cookies, I lay them all out in a baking tray to cool. Posted December 21st, 2009 at 3:32 pm | Log in to reply. Posted December 22nd, 2009 at 3:36 am | Log in to reply. yes, if you want more crunchy cookies, roll the cookie dough thinner and fry it until it is a little dark brown instead of light brown. Put the cookies in a container and keep them in the refrigerator. Your mother-in-law will be impressed when she receives the precious cookies you make! Posted December 22nd, 2009 at 5:52 pm | Log in to reply. Maybe you used too much water. If you have trouble kneading with less water, you can mix vodka to water. As vodka is about 50% water 50% alcohol and as alcohol will evaporate much faster than water, you can use same amount of water as Maangchi and still have more liquid to knead. Posted December 21st, 2009 at 2:57 am | Log in to reply. Where did you buy your food processor at? it looks like it is working really good. Posted December 21st, 2009 at 10:12 am | Log in to reply. I bought it 5 or 6 years ago in Canada. Posted December 20th, 2009 at 11:04 pm | Log in to reply. Love these ginger cookies! Can you also make mooncakes? Posted December 20th, 2009 at 11:45 am | Log in to reply. Oh my! This recipe is the same as Indian traditional cookies, except for the pine nuts..
Posted December 19th, 2009 at 5:56 am | Log in to reply. Like your recipes… The cookie is almost the same as Chinese’s “sek kek mah” but uses malt syrup instead of sugar. By the way, please share the black bean banchan recipe. Like those black bean serve at the restaurants. Thanks. Posted December 19th, 2009 at 11:14 am | Log in to reply. sek kek mah! I should remember the name. Check my kongjorim recipe. You can replace soy beans with black beans. Posted December 19th, 2009 at 3:33 am | Log in to reply. I liked your ginger cookie recipe, but I think you forgot to put sesame oil at the end. Posted December 19th, 2009 at 11:11 am | Log in to reply. oh, I forgot to use it! lol, no sesame oil in this recipe! Happy Holidays! Posted December 19th, 2009 at 1:12 am | Log in to reply. My mom used to make these for me and my sisters when we were growing up. Instead of syrup she put confectioners sugar on them. Happy Holidays everyone! Posted December 18th, 2009 at 5:32 pm | Log in to reply. hey maangchi I just made this half an hour ago and they are delicious but are they supposed to be very crunchy or soft in the middle? mine are very crunchy and are darker brown then your cookies. do you think i overfried them? Posted December 18th, 2009 at 6:47 pm | Log in to reply. They are supposed to be crunchy! Nothing wrong with your brownish cookies. If you like to make cookies like mine (light brown), use fresh oil and make sure to check the oil temperature. It shouldn’t be too high. Posted December 17th, 2009 at 11:47 pm | Log in to reply. Wow, My mother-in-law makes these. So much fresh ginger, it hurts! I’ll show this recipe to her. Thanks Maangchi. Posted December 17th, 2009 at 11:56 pm | Log in to reply. oh, you have tasted this cookie before, cool! Thank you! Posted December 17th, 2009 at 8:16 pm | Log in to reply. Posted December 17th, 2009 at 11:57 pm | Log in to reply. Are you talking about podcast? If so, it will be coming soon. Thank you! Posted December 17th, 2009 at 7:30 pm | Log in to reply. I love these cookies, I love ginger cookies, but I have baked, not fried, I´ll make many cookies for gifts. Posted December 17th, 2009 at 11:58 pm | Log in to reply. Posted December 17th, 2009 at 4:51 pm | Log in to reply. Yes, Just in time for the Holidays! I’m not too skilled with a knife so I’ll just have to stick with my cutters as well, haha. I love watching your vids and trying out new things. I’ll have to take pictures when I try my hand at these~ Happy Holidays, Maangchi! Posted December 18th, 2009 at 12:00 am | Log in to reply. Happy Holidays! Try out this recipe and email me the photo! Posted December 17th, 2009 at 4:16 pm | Log in to reply. YAY! I feel so special cause I requested this recipe! Thanks Maangchi^_^; It’ll make a great winter desert with tea! Posted December 17th, 2009 at 6:58 pm | Log in to reply. one thing i forgot to mention. this is what my mom does. she uses the rectangular/square 만두피 and cuts it into thirds i think. Then you got yourself a maejakgwa base! :D I think its easier for people to use that if they dont have time to cut all those. Posted December 18th, 2009 at 12:01 am | Log in to reply. This recipe was originally posted on December 17, 2009 at 3:54 pm by Maangchi. It was last updated on April 26, 2015. The video was watched 331,748 times on YouTube & has 3,108 likes!